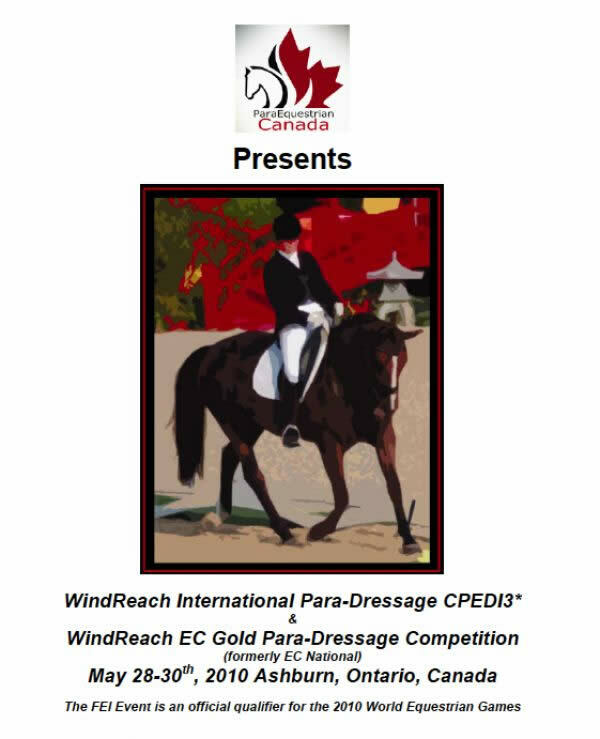 The WindReach International Para-Dressage CPEDI3 show took place at WindReach Farm. The farm was designed by Paralympian rider Alexander (Sandy) J. Mitchell. The entire facility was designed to meet the needs of individuals with different abilities and is equipped with wheelchair accessible pathways. WindReach Farm is also a member centre for the Canadian Therapeutic Riding Association (CanTRA), and the Ontario Therapeutic Riding Association (OnTRA). The United States Para-Equestrians felt honored to compete at such a spectacular facility alongside many other international Para-Dressage riders. This competition was the largest Para-Equestrian competition in North America. There were riders from all over the world including United States, Canada, China, Bermuda, Japan, and Australia. 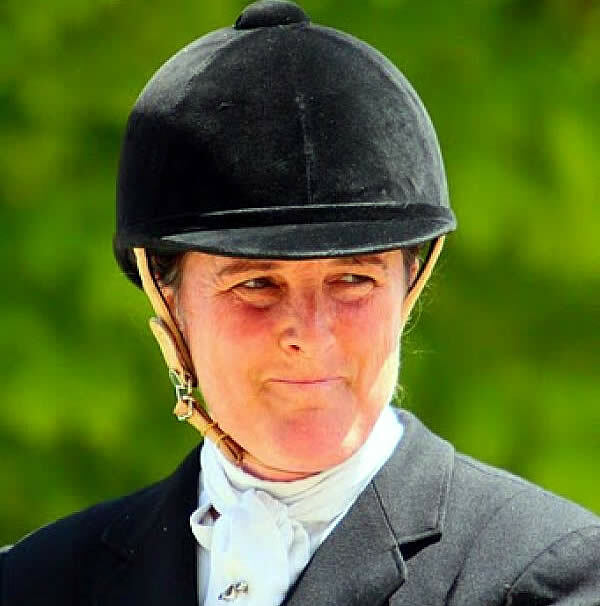 Mary Jordan, a Grade IV Para-Dressage rider used this competition as a practice before the selection trials at the end of June. Jordan rides Paxton Abbey who is a horse she has bred, raised, and trained as an international dressage horse. Jordan commented, “After a long winter of training I wanted the opportunity to be in front of international judges and competitors to be tested in the best way possible on an international stage. That was my goal. I already had my scores in hand so I wanted to be tested. The motivation for me was to come back in the international atmosphere and really step up my game and be as competitive as possible. After a short break, riders will make their way to Lamplight Equestrian Center in Wayne, IL, for the WEG selection trials. Currently, 15 United States Para-Dressage riders have scores that will allow them to compete at the selection trials. Out of those 15, ten of the riders will be selected for WEG. Out of the ten riders, four will make the team, and six will ride as individuals. Mary Jordan. Photo © Dr. C. Mike Tomlinson. Once the selection trials occur, the Para-Dressage riders will take a few months to train and rest before traveling to Lexington, Kentucky for the 2010 Alltech FEI World Equestrian Games. The Para-Dressage competitions will take place in the Covered Arena at the Kentucky Horse Park starting on October 5, 2010, and ending October 8, 2010. Starting on October 5, 2010, the Individual Team Tests are scheduled, and riders will compete with their horses for four days, ending with Individual Freestyle Tests on October 5, 2010. The USPEA includes every equestrian discipline that is practiced by athletes with physical disabilities. Each rider or driver competes under the eight Para-Equestrian disciplines of the National Organization. This year, at the 2010 Alltech FEI World Equestrian Games, the Para-Dressage discipline will make history competing under the eighth discipline of the USEF. The USEF High Performance Para- Dressage team will compete as an FEI sport for the first time at the 2010 Alltech FEI World Equestrian Games held in Lexington, KY. The USPEA provides programs, clinics, and competition opportunities for athletes with physical disabilities. Riders compete under the USEF rules during their competitions and many of the athletes compete at the highest level of their sport.